2012 Lexus RX450h F Sport review | What Car? The Lexus RX450h F Sport is the sporty, attention-grabbing version of the company's newly updated hybrid SUV. It uses a 3.5-litre V6 petrol engine mated to an electric motor, which helps it accelerate from 0-62mph in 7.8 seconds. It also averages a claimed 44.8mpg and achieves a CO2 figure of 145g/km. All new RX450h models get a 'spindle'-shaped front grille and redesigned tail-lights. Meanwhile, the interior features more equipment and an upgraded version of Lexus's Remote Touch infotainment controller. F Sport cars add 19-inch alloys, a deeper front bumper, swivelling LED headlights and sportier chassis settings, including a lateral damper system that improves stability. What's the 2012 Lexus RX450h F Sport like to drive? Move off gently and the RX450h is in full electric mode. When you ask for more urge the petrol engine kicks in seamlessly, with the electric motor helping out at higher speeds, too. Progress is generally hushed, although under hard acceleration the standard CVT auto gearbox holds the engine at high revs, making it sound noisy and strained. All RXs gains a new Sport mode, which sharpens the throttle and steering responses, and makes the stability and traction control systems less intrusive. The RX feels more taut in this mode, but there's still a fair amount of body roll, and the steering feels heavy and vague. The trick dampers are designed to improve ride comfort by absorbing small vibrations. However, the F Sport's ride is pretty unsettled, and bumps and broken surfaces thud into the cabin. At least there's little wind or road noise to disrupt the peace at speed. 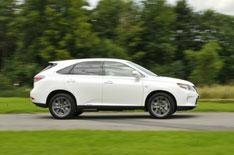 What's the 2012 Lexus RX450h F Sport like inside? The RX450h has a luxurious and well-built cabin, and it's easy to find a comfortable driving position because there's a huge range of electric adjustment. F Sport cars get leather seats and a handsome new steering wheel, as well as drilled aluminium pedals that continue the sporty theme. The infotainment screen is large and easy to read. However, the mouse-like Remote Touch controller is still too fiddly to use on the move. There's plenty of head- and legroom for front and rear passengers, but although the boot is large, many rivals' are bigger. The RX450h F Sport is beautifully made and well equipped, and it will be cheap to run as a company car because it qualifies for the 20% company car tax band; a diesel BMW X5 is charged at 33%. The RX450h SE is even more appealing, though, because it's 7000 cheaper. It's just a shame the RX doesn't ride or handle as well as a luxury SUV should.